This should not really be news to anyone, but just in case it is, read this article, about US sponsored terrorist groups which launch attacks against Iran. Yes – US sponsored terrorist groups. Oh the hypocritical bastards. As if that wasn’t enough, 2 additional US carriers are heading towards Iran right now. So what, we have hundreds of scientists, civil engineers, law enforcement officers, overall probably several thousands of people willing to testify on record that 9/11 was a controlled demolishion, but here’s another very notable person to agree. This man is a US Navy Seal, whom has a speciality in demolishions. Never mind his evidence, you can find a seemingly infinite amount of it if you cared, his personal opinion as a person with high expertise in this field is I feel worth much more. Although there are sites devoted to this, I wanted to make a really really brief personal list, of what’s going down in 2012, and around that time. – Religious texts point to apocalypse & coming of Christ, the events of today can be equated with the content of the book of revelations, but similar things in other religions as well. – Ancient Civilization Prophesies about cataclysms / cosmic alignment in 2012. – Related, biological evidence of a polar shift in progress, tied to many animals losing the ability to navigate around Earth in addition to other evidence. – Planet “Nibiru”, also known as “Planet X”, also referred to as “Sira” by NASA (something like that), whom are claiming it is a red dwarf star (despite the fact that the planet is covered in water – as can be seen from X-Ray photographs available from NASA), which came out of nowhere and poses no threat (yeh right). – Renewed Cold War between USA and Russia, specifically the possibility of the deployment of Russian forces in Cuba. – The tensions between USA and Iran, although if a war were to begin, it would probably occur before 2012. Also, the next US election is in 2012? Hmmmm. – Most world governments spending hideous sums of money on building new and refurbishing old nuclear shelters and underground facilities, designed for sustaining human life for long periods of time. Publicised openly on f2a TV in certain countries, but not in others. – Published deadline for USA’s JSF and Russia’s PAK-FA aircraft fighter projects is 2011-2012 (thought it might be relevant). Funny segment on Letterman, amirite? Here’s a pretty good fact-page. Have a guess of who that page is about, I don’t think it will take you long to figure it out. •In my first year in office I set the all-time record for most days on vacation by any president in US history (tough to beat my dad’s, but I did). •I’ve made my presidency the most secretive and unaccountable of any in US history. •I took the world’s sympathy for the US after 9/11, and in less than a year made the US the most resented country in the world (possibly the biggest diplomatic failure in US and world history). •I am the first US president in history to have a majority of the people of Europe (71%) view my presidency as the biggest threat to world peace and stability. •I changed US policy to allow convicted criminals to be awarded government contracts. •I have removed more freedoms and civil liberties for Americans than any other president in US history. Unfortunately embedding is disabled for that video (duno why). 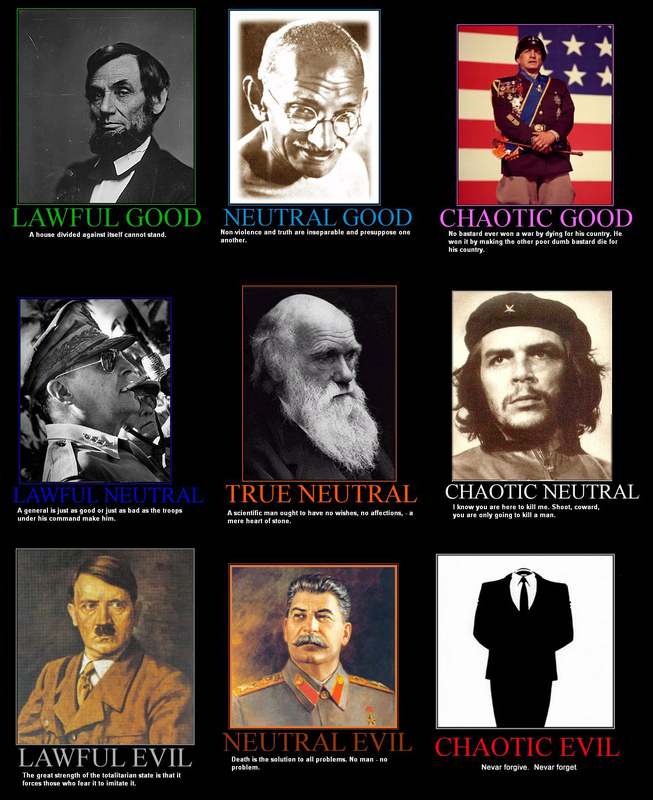 My result is: True Neutral. This is a bit disappointing, but I couldn’t relate to many of the questions asked anyway. This test seems like a good idea though.